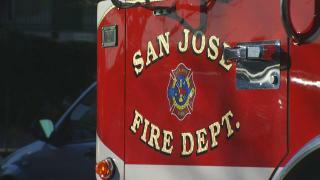 A firefighter suffered minor injuries and four people were displaced following a fire that damaged a mobile home in north San Jose early Sunday morning, according to fire officials. The blaze, first reported at 12:27 a.m. at the residence located at 587 Hermitage Drive, was extinguished around 1:10 a.m., San Jose Fire Capitan Kevin Stidham said. The occupants inside the home were able to evacuate safely thanks to a working smoke detector. The cause of the blaze is under investigation. Those displaced are staying with family or friends. No further information on the extent of the firefighter's injuries was released.